A diagram depicting a twistor -- an extended entity in space and time that can be thought of as a 2-dimensional light ray. Credit: Penrose, R., & Rindler, W. (1986). Spinors and Space-Time (Cambridge Monographs on Mathematical Physics). Cambridge: Cambridge University Press. 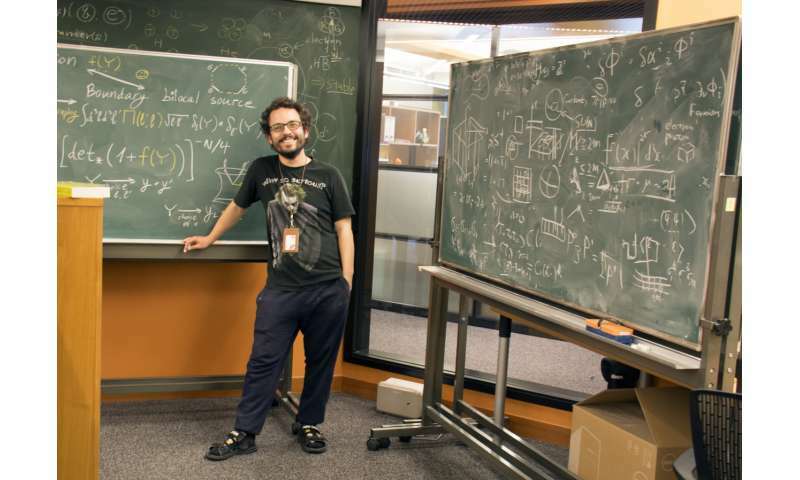 The modern-day theoretical physicist faces a taxing uphill climb. "As we learn more, reality becomes ever more subtle; the absolute becomes relative, the fixed becomes dynamical, the definite is laden with uncertainty," writes physicist Yasha Neiman. A professor and head of the Quantum Gravity Unit at the Okinawa Institute of Science and Technology Graduate University (OIST), he grapples with this conundrum on a daily basis. Quantum gravity, Neiman's branch of physics, aims to unify quantum mechanics, which describes nature at the scale of atoms and subatomic particles, with Einstein's Theory of General Relativity—the modern theory of gravitation as the curvature of space and time. How, he asks, can physicists write equations when the geometry of space itself becomes subject to quantum uncertainty? Quantum gravity, the current frontier in fundamental theory, has proven more difficult to detangle than previous concepts, according to Neiman. "With the concept of space slipping between our fingers, we seek out alternative footholds on which to base our description of the world," he writes. This search for alternative footholds is, in essence, a search for a new language to describe reality—and it is the subject of his most recent work, published in the Journal of High Energy Physics. In the paper, Neiman proposes a new vantage point on the geometry of space and time—one that builds on well-established approaches in physics, like holography and twistor theory, to reach new ground. Holography is an offshoot of string theory, the theory that the universe is made up of one-dimensional objects called strings, which was developed in the late 1990s. Holography imagines the ends of the universe as the surface of an infinitely large sphere that forms the boundary of space. Even as geometry fluctuates within this sphere, this "boundary at infinity" on the sphere's surface can remain fixed. For the past 20 years, holography has been an invaluable tool for conducting quantum-gravity thought experiments. However, astronomical observations have shown that this approach cannot really apply to our world. "The accelerating expansion of our universe and the finite speed of light conspire to limit all possible observations, present or future, to a finite—though very large—region of space," Neiman writes. In such a world, the boundary at infinity, where the holographic picture of the universe is based, is no longer physically meaningful. A new frame of reference may be needed—one that does not attempt to find a fixed surface in space, but which leaves space behind altogether. In the 1960s, in an attempt to understand quantum gravity, physicist Roger Penrose proposed such a radical alternative. In Penrose's twistor theory, geometric points are replaced by twistors—entities that most closely resemble stretched, light ray-like shapes. Within this twistor space, Penrose discovered a highly efficient way to represent fields that travel at the speed of light, such as electromagnetic and gravitational fields. Reality, however, is composed of more than fields—any theory needs also to account for the interactions between fields, such as the electric force between charges, or, in the more complicated case of General Relativity, gravitational attraction resulting from the energy of the field itself. However, including the interactions of General Relativity into this picture has proven a formidable task. So can we express in twistor language a full-fledged quantum gravitational theory, perhaps simpler than General Relativity, but with both fields and interactions fully taken into account? Yes, according to Neiman. Neiman's model builds on higher spin gravity, a model developed by Mikhail Vasiliev in the 1980s and '90s. Higher spin gravity can be thought of as the "smaller cousin" of String Theory, "too simple to reproduce General Relativity, but very instructive as a playground for ideas," as Neiman puts it. In particular, it is perfectly suited for exploring possible bridges between holography and twistor theory. On one hand, as discovered by Igor Klebanov and Alexander Polyakov in 2001, higher spin gravity, just like string theory, can be described holographically. Its behavior within space can be captured completely in terms of a boundary at infinity. On the other hand, its equations contain twistor-like variables, even if these are still tied to particular points in ordinary space. From these starting points, Neiman's paper takes an additional step, constructing a mathematical dictionary that ties together the languages of holography and twistor theory. "The underlying math that makes this story tick is all about square roots," writes Neiman. "It's about identifying subtle ways in which a geometric operation, such as a rotation or reflection, can be done 'halfway.' A clever square root is like finding a crack in a solid wall, opening it in two, and revealing a new world." Using square roots in this way has a longstanding history in math and physics. In fact, the intrinsic shape of all matter particles—such as electrons and quarks—as well as twistors, is described by a square root of ordinary directions in space. In a subtle technical sense, Neiman's method for connecting space, its boundary at infinity, and twistor space, boils down to taking such a square root again. Neiman hopes that his proof of concept can pave the way toward a quantum theory of gravity that does not rely on a boundary at infinity. "It will take a lot of creativity to uncover the code of the world," says Neiman. "And there's joy in fumbling around for it." Both space and time are misunderstood concepts (or actually mathematically doomed if QED and GR are to marry.). New maths always seems to point us to new understandings. As Minkowski spacetime did. As general relativity did. As Feynman's underlying QED equations did. The claim of the universe accelerating is a false idea like "dark matter" that is being eagerly promoted by those who don't want truth known. Perlmutter said they looked at a galaxy known to be five billion light years away from its Doppler Shift and the Hubble Constant. Then they scanned a Type Ia supernova in the galaxy and found its maximum luminosity to be less than expected, so it must be farther away than five billion years. The Doppler Shift, though, hasn't changed and neither has its velocity based on the Doppler Shift. So the galaxy is still moving away at the same speed as before! The supernova is moving away faster than the calculated velocity of the galaxy, supposedly, based on its maximum brightness, but the galaxy still has to be moving away at the same speed because the Doppler Shift is the same as before! Note, too, if the universe is accelerating, it must be accelerating at all times, so the speed and distance relationship cannot be constant. But, in the recent past, the Hubble Constant is reliable, so the speed and distance relationship does not show acceleration in the recent past! The claim of the universe accelerating is a false idea like "dark matter"
Whether the universe is actually accelerating or if dark matter actually exists, the 'idea' of the universe accelerating or dark matter certainly isn't, as you put it, "false", but rather is perfectly reasonable and valid because it is based on the empirical evidence and Occam's razor and the reasonable assumption that our current understanding of the laws of physics is, at least in the main, correct albeit not necessarily complete. ...that is being eagerly promoted by those who don't want truth known. What? All those millions of scientists far smarter than you or I that know things we don't theorized from their empirical evidence and Occam's razor the two theories of an accelerating universe and dark matter purely to just 'deceive' us because THEY "don't want truth known"? Really? Utterly absurd! I suggest it is more likely you who "don't want truth known". If we are going to invoke Occam's razor and beg for the most simple explanation, then as the field mechanic I will inform everyone that the most simplex theory of everything is based on field pressure mediation. To go into detail would demand showing how all past experimental observation fully supports this claim. It is the most fundamental expression of what we call "force". However the common F=ma is so incomplete and vague it is laughable. There are no straight lines in this universe. There is one field. It is a bound field as pressure variable is true. There is an absolute lowest energy potential at all cartesian locations. Each location is a scalar pressure potential. All locations are in equilibrium until perturbation occurs. Once it occurs, exponential imbalance is the result. Wrap your mind around the concept of field pressure mediation and the type of acceleration that is common between two or more mutual masses. Coherency determines the inertial momentum of acceleration. When exponential imbalance occurs, we then have manifest order that lessens over a chronological range. Entropy is the cause of the arbitrary observation of time. Entropy is the mediation of field imbalance. That is all. This is why Entropy can never be bypassed or prevented. All pressure field expressions within a boundary are subject to entropic laws. The fundamental law that fully explains all spatial phenomena is the path of least resistance towards field pressure equilibrium. "As we learn more, reality becomes ever more subtle; the absolute becomes relative, the fixed becomes dynamical, the definite is laden with uncertainty,"
Wow. Well put Yasha, a beautiful and poetic description of the mystery we all currently inhabit. Thank you for your research. Twistor theory sounds kind of cool and dimensional at least. I've always wondered why sub-particles can't just be light following a circular path? I know the wavelength is supposed to be longer than atoms. However, light travelling through a medium goes slower. I know that is supposed to be interaction but couldn't the light just be getting fatter and shorter as it travels through denser space? If it did that then as a sub-particle it could be very fat and very short as well as travelling in a circular path? If light did get fatter/shorter and equally slower forward (but retain the same energy) couldn't it be trapped like this? That would be more like a transition than a complete change? Most of the people here know that the situation is very complex and cannot be understood by reading one news release, nor resolved in one paragraph no matter how big and fat you make it. On a brighter note the pope just declared that hell doesnt exist so posting crap won't send you there. I actually watched this whole lecture and may have understood a great deal of it. What I didn't get is whether it has the potential of eliminating uncertainty. It seems that that was the purpose of getting rid of spacetime and QM - knowing all there is to know about an object. Yeah I wondered about that. Or Jesus developed a conscience. Any virgins left in heaven? Are these questions we can finally answer once we get rid of spacetime and QM? This holographic principle is most rigorously defined in the AdS/CFT correspondence. I should not neglect to say that this does not mean it is a rigorous definition; merely that it is the most rigorous so far. 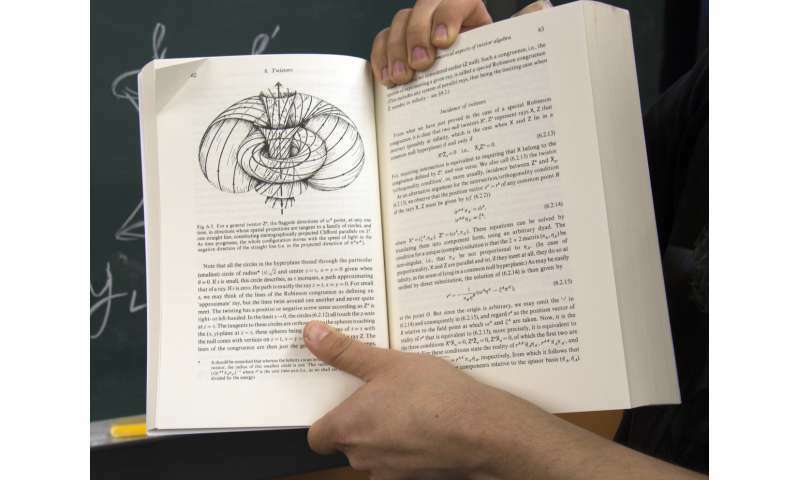 I was interested in twistors when I first read about them, but wading through Penrose didn't get me to where I felt like it was anything but interesting math. I have great respect for math, but if it's not connected with physical reality I get just so far and then feel like I haven't made any progress in understanding anything but math itself. I'm too practically and physically goal oriented to make a great mathematician. But I never said twistors are BS. It's good to see someone with more ability than I have connect them to the holographic principle and thereby through the AdS/CFT correspondence to the current bleeding edge of string physics. Intuitively, a twistor "looks like" a Calabi-Yau space geometry; by that I mean it seems as if they might both be members of a class of geometries that is not yet well defined, at least to my purely geometric and not at all rigorous intuition. I will be very interested to see whether twistors, perhaps with some additional element that we have not yet discovered, might wind up giving a well-defined and rigorous underpinning to GRT that can then be connected through the AdS/CFT correspondence to string physics, in which case it might be profitable to investigate whether the math of twistors, plus this additional ingredient, might help pare down the googol-to-the-ninth possible Calabi-Yau geometries to something more manageable. Pure speculation, of course- but this may be promising and it's certainly well enough defined for the real mathematicians to start looking at IMVHO. This is the most promising approach to quantum gravity that I have seen in a long time-- years. It is quite significant that Penrose himself has often stated that twistors are an approach to quantum gravity, and gives good evidence of it. If that twistor approach turns out to be through the AdS/CFT correspondence and thereby through string physics and M theory there's gonna be a lot of coffee spit on a lot of keyboards and monitor screens. And if the selector for Calabi-Yau geometries turns out to be through twistors there's gonna be a lot of red faces, too, because twistors have been around for quite a while now. Twistor theory seems like an attempt to unify Vortex theory with String theory. All purely theoretical, of course. We need to send star ships out there at phenomenal velocities to provide the empirical evidence we need to confirm them. Until then, it's all just interesting reading, but will remain speculative. Penrose is no slouch; he's probably one of the five or ten most accomplished theoretical gravity physicists that's ever lived. He has collaborated with Hawking, and together they shared a Wolf Prize for the Penrose-Hawking singularity theorems. Twistor theory has been used in soliton theory, and several other more esoteric pieces of physics, with results that are observed and consistent with other analyses. Twistor theory is the application of differential geometry to General Relativity Theory (GRT) and was from its inception. It's not speculative in any way. It's quite firmly mathematically based, and it gives the correct answers to the extent we can test them; Yang-Mills gauge theory can be recovered from it, yielding the Standard Model which gives predictions of every lab experiment we've ever seen. It is still under development, as can be seen from this article. It's not mainstream, but it doesn't contradict the mainstream either. I think you're overly dismissive. Holy Father just meant with it it's already full not being projected to such a large capacity - so that we've to stay in queue... He's a rebel reptilian..